I love metallic spray paints. My favorites right now are silver and gold. I have a fondness for oil rubbed bronze too but it’s not as glitzy. 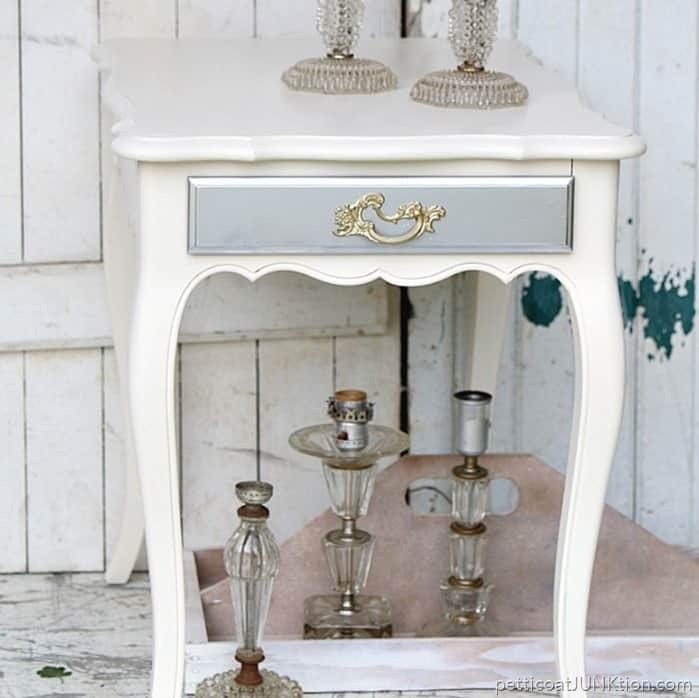 Today is Themed Furniture Makeover Day and this month’s theme is “Glitz and Glamour”. Right up my alley. I also love glitzy vintage rhinestone jewelry…..but that’s another story. The project piece is a sad little table that needed a lot of love. The JTS bought it at an auction. I think he said he paid $2 for it. Can’t beat that. 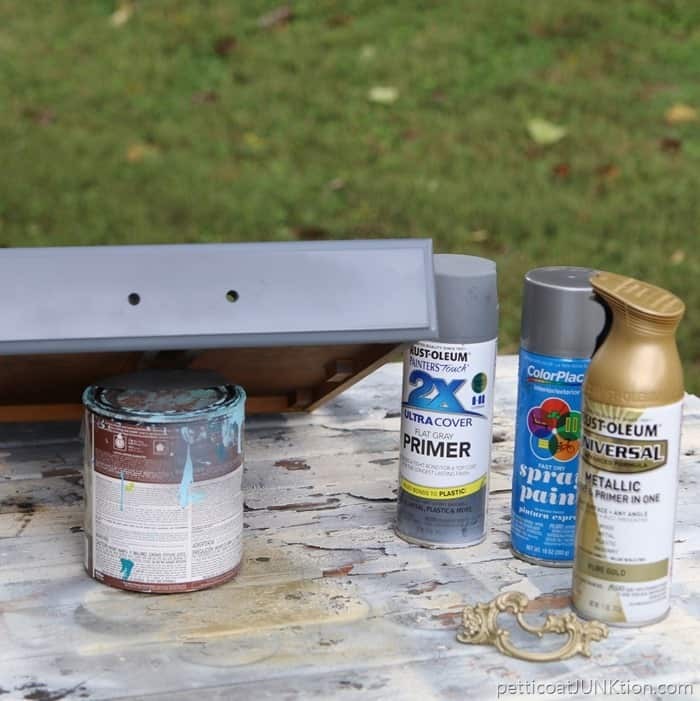 I primed the drawer front with Rustoleum Gray Primer then used spray paint from Walmart, Aluminum color. I’ve bought several brands and colors of silver spray paint but this one is my favorite.I painted the original hardware with RustOleum Metallic Pure Gold spray paint. 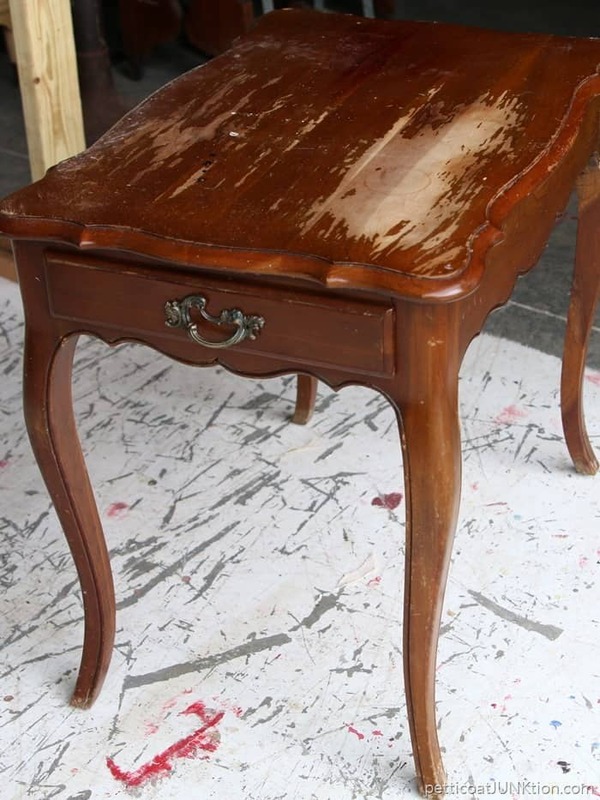 The body of the table is painted with Reclaim paint in off-white. No distressing on this piece. Hard to believe I know. This little table looks so much better and it says “Glitz and Glamour” to me without being over the top. 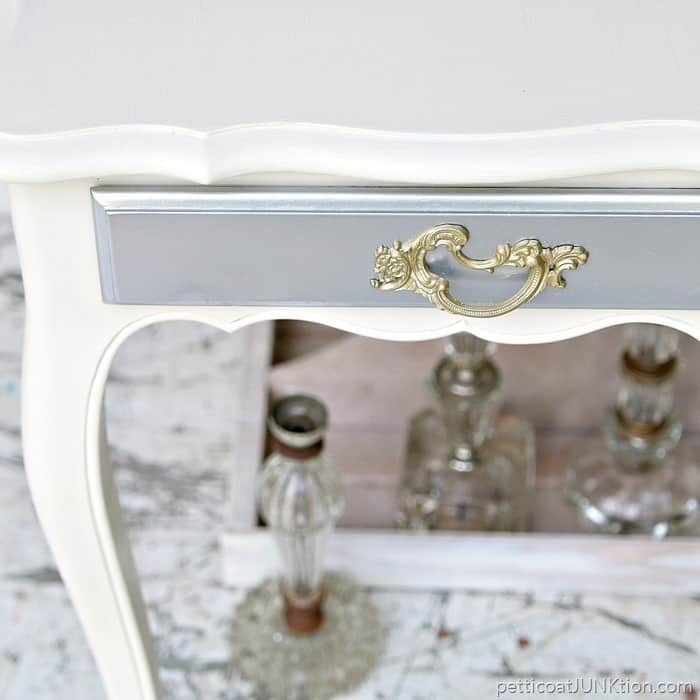 I’m not a fan of using spray paint for a complete furniture makeover but a bit on drawer fronts or other details is fine in my book. I staged the photos using several pieces from my vintage lamp collection (stash). I have a weakness for glass lamps. 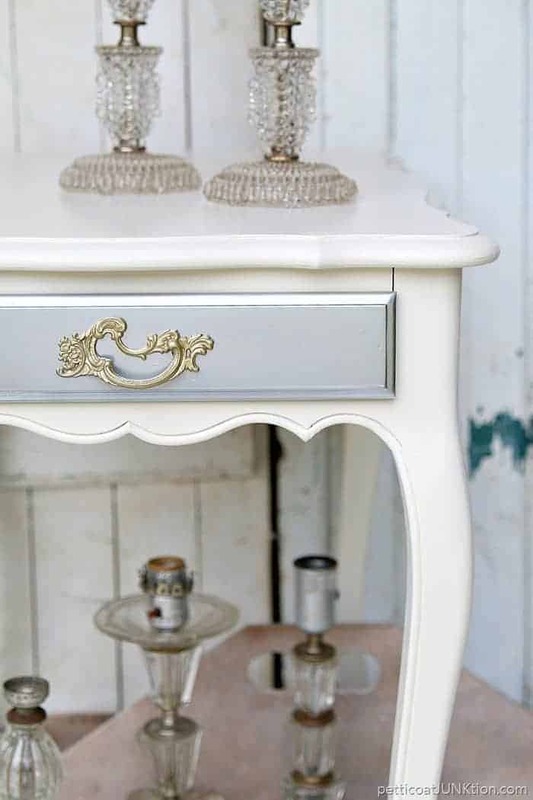 If you like shabby chic white furniture you will love my latest video…..
Time to Glitz and Glam with the DIY Furniture Girls. Just click the photos below. Have a great weekend and I’ll see you Monday. What a gorgeous piece. You did a beautiful job. PINNED!! I do love my silver and gold spray paints! What a beautiful makeover. Love that table! The silver is perfect. Thanks for linking up to Merry Monday! Sharing on G+! Have a great week! Kathy, I LOVE what you did with little table. I think it’s my favorite of all the posts. It’s just so simple and elegant with it’s silver drawer against the white. Great example of glitz. I love vintage rhinestone jewelry, too. Could be fun to use some rhinestones on a piece of furniture. Just a touch of the sparkle could be really elegant. Thanks Naomi! You made my day. She is a flashy little thing. What a gorgeous table! I love the color combination that you used and especially love the pretty gold pull. Great job on your video as well! It’s just gorgeous, Kathy! And I have never seen a drawer pull like that – so cool! 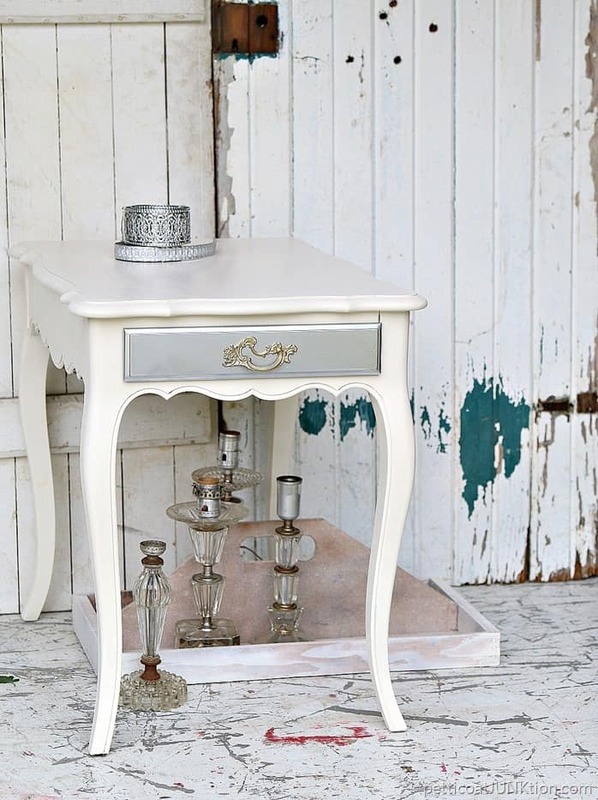 Kathy, this little table is just the sweetest makeover! So very perfect for glitz and glamour and not over the top!!! Beautiful makeover! Love the color combo you chose. That poor, beat up table looks brand new again. What a transformation! Just GORGEOUS!!! I can’t believe it’s the same table! Perfect color combination and looks like something out of the glamorous 30s! She is gorgeous Kathy! I just passed up a pair of these tables! Now I wish I would have picked them up! I love the glitz you added to your piece. This sweet auction table is now a glamour star ready to take her place in her forever home. I love your combo of colors on this table. I’m also excited to learn about your fav color of spray silver and the brand of off-white on the body. I’ll be trying both of these very soon. Great makeover. Thanks for sharing your tips and tricks.